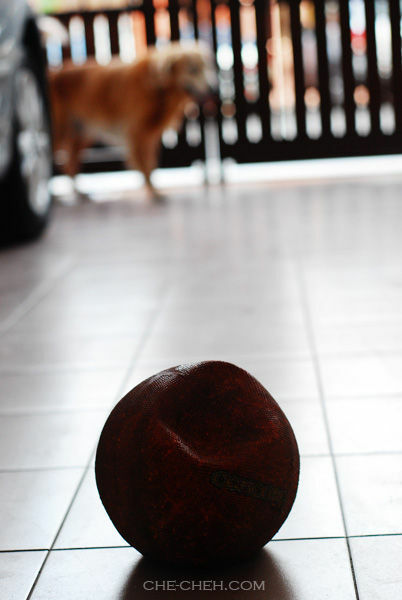 The Only Ball That Survived My Dog’s Appetite! I’ve bought quite a few balls for my dog throughout his 7 years of life. You see, my dog loves playing football. In fact I consider him as one of the country’s top dog footballer… Hahaha. He’s pretty good at attacking but his main specialty is defending. Unfortunately all balls did not survived his menacing ‘dracula’ teeth. Some balls got through a couple of days. Some balls only survived a few minutes. One ball (a football) survived a couple of months. But that also got punctured by my dog. Then one day I decide to purchase a basketball as I guess they’re ‘harder’. I bought one home and lo and behold the ball bounce so hard that I was afraid it’ll knocked my dog’s tooth off or fracture his mouth. But aiyoo my dog got the better hold of it. He return the favor by puncturing the basketball. I thought “Cham lo. No ball can survive my dog’s appetite!”. These are the few scolding that I receive whenever I scream out loud for my football team, Manchester United. Don’t shout. You want neighbor’s baby to wake up? Stop shouting. Do you know it is very late now? Cho Cho Cho (noisy/bising) Keep quiet!!! If you want to scream, use a pillow to close your mouth first.